ipod – Carpet Bomberz Inc.
A few news outlets have also speculated on the meaning of Samsung’s announcement of their newest, largest capacity 1.8 inch HDD. Now some enterprising tech news hounds have discovered that the supply off the iPod Classic is ‘constrained’ through bigger outlets like Amazon.com though the Apple Store online seems to still be showing supplies of the gray colored option. Which all leads to the question what gives? Apple could potentially upgrade the Classic to use a recent 220GB Toshiba drive, sized at the 1.8 inches the player would need. 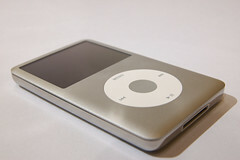 via iPod classic stock dwindling at Apple, other retailers | iPodNN. Interesting indeed, it appears Apple is letting supplies run low for the iPod Classic. No word immediately as to why but there could be a number of reasons as speculated in this article. Most technology news websites understand the divide between the iPhone/Touch operating system and all the old legacy iPod devices (an embedded OS that only runs the device itself). Apple would like to consolidate its consumer products development efforts by slowly winnowing out non-iOS based ipods. However, due to the hardware requirements demanded by iOS, Apple will be hard pressed to jam such a full featured bit of software into iPod nano and iPod shuffles. So whither the old click wheel interface iPod empire? Toshiba rolls out 220GB-Could the iPod Classic see a refresh? I still think the iPod Classic is a very useful product. A lot of fanbois of the iPhone/Touch persuasion will demand Apple drop the Classic like a hot potato and go without spinning hard drives one and for all time. I say bring on the HDDs. It’s useful technology and still holds more files for less money even as Flash memory prices come down and volume production ramps up. Toshiba Storage Device Division has introduced its MKxx39GS series 1.8-inch spinning platter drives with SATA connectors. via Toshiba rolls out 220GB, extra-compact 1.8-inch hard drive | Electronista. Seeing this announcement reminded me a little of the old IBM Microdrive. A 1.8″ wide spinning disk that fit into a Compact Flash sized form factor (roughly 1.8″ square). Those drives were at the time 340MB and astoundingly dense storage format that digital photographs gravitated to very quickly. Eventually this Microdrive was improved up to around 1GByte per drive in the same small form factor. Eventually the market for this storage dried up as smaller and smaller cameras became available with larger and larger amounts of internal storage and slots for removable storage like Sony’s Memory stick format or the SD Card format. The Microdrive was also impeded by a very high cost per MByte versus other available storage by the end of its useful lifespan. But no one knows what new innovative products might hit the market. Laptop manufacturers continued to improve on their expansion bus known as PCMCIA, PC Card and eventually Card Bus. The idea was you could plug any kind of device you wanted into that expansion bus connect to a a dial-up network, a wired Ethernet network or a Wireless network. Card Bus was 32-bit clean and designed to be as close to the desktop PCI expansion bus as possible. Folks like Toshiba were making small hard drives that would fit the tiny dimensions of that slot, containing all the drive electronics within the Card Bus card itself. Storage size improved as the hard drive market itself improved the density of it’s larger 2.5″ and 3.5″ desktop hard drive product. I remember the first 5GByte Card Bus hard drive and marveling at how far folks at Toshiba and Samsung had outdistanced IBM. Followed soon after by the 10GByte drive. However just as we wondered how cool this was, Apple created a copy of a product being popularized by a company named Rio. It was a new kind of hand held music player that primarily could play back audio .mp3 files. It could hold 5GBytes of music (compared to 128MBytes and 512MBytes for most top of the line Rio products at the time). It had a slick, and very easy to navigate interface with a spinning wheel you could click down on with the thumb of your hand. Yes it was the first generation iPod and it demanded a large quantity of those little bitty hard drives Samsung and Toshiba were bringing to market. Each year storage density would increase and a new generation of drives would arrive. Each year a new iPod would hit the market taking advantage of the new hard drives. The numbers seemed to double very quickly. 20Gig, 30Gig-the first ‘video’ capable iPod, 40Gig,60gig,120gig and finally today the iPod Classic at a whopping 160GBytes of storage! And then the great freeze, the slowdown and transition to Flash memory based iPods which were mechanically solid state. No moving parts, no chance for mechanical failure, no loss of data and speeds unmatched by any hard drive of any size currently on the market. The Flash storage transition also meant lower power requirements, longer battery time and now for the first time the real option of marrying a cell phone with your iPod (I do know there was an abortive attempt to do this on a smaller scale with Motorola phones @ Cingular). The first two options were 4GB and 8GB iPhones using the solid state flash memory. So wither the iPod classic? iPod Classic is still on the market for those wishing to pay slightly less than the price for an iPod touch. You get much larger amount of total storage (video and audio both) but things have stayed put at 160GBytes for a very long time now. Manufacturers like Toshiba haven’t come out with any new product seeing the end in sight for the small 1.8″ hard drive. Samsung dropped it’s 1.8″ hard drives altogether seeing where Apple was going with its product plan. So I’m both surprised and slightly happy to see Toshiba soldier onward bringing out a new product. I’m thinking Apple should really do a product refresh on the iPod classic. They could also add iOS as a means of up-scaling and up-marketing the device to people who cannot afford the iPod Touch, leaving the price right where it is today. Apple lineup: The Netbook is already here. Say you that own a cell phone and you’re already an AT&T subscriber. You envy all your friends who have purchased iPhones, but you know AT&T forces you to buy a pretty substantial data plan to connect that iPhone to the Internet where you may roam. That’s bee the single biggest deal breaker for me since the iPhone was introduced. So what if you could have an iPhone (sort of) without paying for the Data Plan? I’m beginning to think the iPod touch is not an end-of-life product that should be ignored. Oh, I did at one time due to the torrid pace at which Apple was releasing new iPhone products. Seemed like the old iPod was absolutlely superfluous. As the iPhone models increased their storage and speed, the iPod touch tagged along, but not too closely. Currently the iPod touch is consider a second generation device (2G) versus the iPhone in its 3G and now 3GS forms. Like most of you who may not own an I phone, I have felt the pressure of seeing all my friends of Facebook buying iPhones and cross-posting from Twitter to Facebook via their iPhone. So caving into peer pressure, I’m considering buying an iPhone maybe in October when I reach the 3 year mark as a customer with AT&T. I have some things working in my favor though. I lucked out with being a Cingular customer before they combined with AT&T and before the exclusive distribution deal for the iPhone. But do I really need to buy an iPhone to get all the benefits of the App Store? Do I need to pay for the big hefty data plan? But, perhaps the real story with respect to the forthcoming Apple Tablet Device is that Apple has already released a tablet computing device. It’s called the iPod touch, and because it’s often overshadowed by its noisier sibling, the iPhone, we sometimes forget that it has already sold 15M+ units. Today J.P. Morgan is also saying, Apple is already in the netbook market. They have a device called the iPod touch. The J.P. Morgan report views the iPod touch as Apple’s netbook, of sorts. At least, the analysis says, until Apple officially enters the netbook market – something the firm expects the Mac maker to do. via AppleInsider | iPod touch seen as small but stealthy asset in Apple lineup. Given the confidence level of reading these two articles I am more willing to consider an iPod touch. It seems like a more frugal choice without the burden of un-ending data plan fees. True the cost is not susidzied by AT&T, but that one time shot of money is about what I was willing to spend on a netbook anyways. So maybe an iPod touch is the better option if you want to save a little cash by not purchasing a huge data plan from AT&T. Author carpetbomberzPosted on July 21, 2009 July 20, 2009 Categories computers, macintosh, technology, wired cultureTags ipod, netbook, tablet, touch3 Comments on Apple lineup: The Netbook is already here.